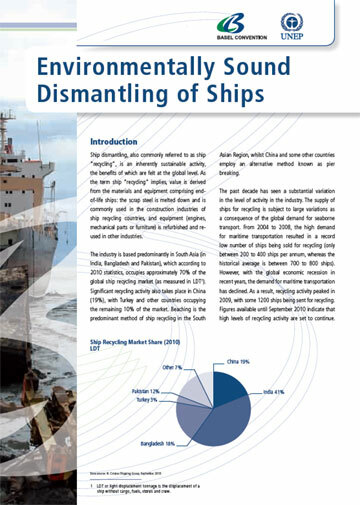 Consider mechanisms to promote jointly the implementation of the relevant guidelines on ship scrapping, as well as to monitor progress of any jointly organized technical cooperation activities. The Terms of Reference of the Joint Working Group can be accessed here. 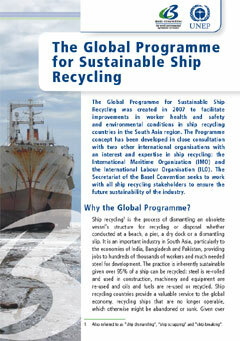 The Joint Working Group held its first session from 15 to 17 February 2005 at IMO Headquarters in London. Session report: Arabic, Chinese, English, French, Russian, Spanish; all meeting documents (in English) can be accessed here. The Joint Working Group held its second session from 12 to 14 December 2005 at the United Nations Office in Geneva. Session report: Arabic, Chinese, English, French, Spanish; all meeting documents (in English) can be accessed here. The third session of the Joint Working Group was held from 29 to 31 October 2008 at the ILO Headquarters in Geneva. Further information on the meeting, including session documents, can be accessed on the ILO Sectoral Activities website. The report of the meeting (currently only available in English) can be accessed here.